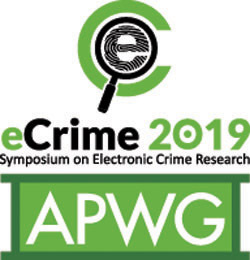 For 2019 APWG's members will once again come together to bridge the gaps between cybersecurity operations, research and consumer messaging with our fourteenth Symposium on Electronic Crime Research (eCrime 2019). eCrime 2019 will look at the operational challenges and development of common resources and best practices for first responders and forensic professionals. In addition, the conference will dive into current research projects and future areas of interest for cybercrime investigations, forensic techniques and infrastructure defense. including our peer-reviewed cybercrime published paper program with the IEEE-SA. The 2019 program is co-hosted by our partners CyLab at Carnegie Mellon University and The National Cyber-Forensics and Training Alliance (NCFTA). eCrime 2019 will begin with a one day CTF program and a Workshop to deep dive into specific challenges investigating and fighting cybercrime. The main three day program will include presentation around the operational, technological and social challenges in the cybersecurity industry and law enforcement. Insight from around the world from industry, government, law and forcement will be brought together with academia to direct resources and focus efforts in this dynamic threatscape. With eCrime 2019 we will review the development of response paradigms and resources for counter-cybercrime managers and forensic professionals in the private and public sectors. Presenters will review case studies of national and regional economies under attack, narratives of successful trans-national forensic cooperation, while considering models for cooperation against ecrime and examining resources for cybercrime response and forensic enterprise. This program will be held on November 12th - 15th at Carnegie Mellon University, Pittsburgh, PA, USA.